It was our school's Summer fayre today so I have spent it making tea and handing out strawberries and cream (but typical Scottish weather it was overcast and dreary! )but hopefully we will get a good boost to the school funds!! My husband then took me out for lunch so have now got a wee while to make something for this weeks Muse Challenge . 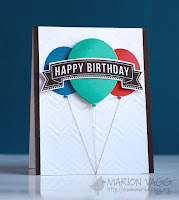 Marion's card is simple beautiful and as the colours of the three balloons just pop out at you went with that for my card and kept it really simple.I used Uniko studio's circle from the round in circles set in roughly the colours that Marion used and to finish added a sentiment by Altenew. Hopefully it will do one of my nephews birthdays as I am running low on male cards! I bet the Scottish berries were yummy, despite the weather! I love how you've interpreted this in a graphic design I think it's a perfect design for a man! Can't wait to see your MCV card - I just finished mine and it will be up in the morning! Thanks so much for joining us at Muse this week, Jenni! Such a fabulous design Jenni - I love how you interpreted my card. Thanks so much for playing along at Muse this week. Jenni I adore this... look at you! Such a treat!